DeAngelis Studio of Music, serving Northern MA and Southern NH, has been teaching students in its convenient Haverhill, MA location for almost a decade. Founded by Michael DeAngelis, with over 30 years of teaching experience, DeAngelis Studio has been voted the most popular Music School in the Merrimack Valley by kids and adults alike. While you are here researching the best school for you, please consider the benefits of becoming a DeAngelis Studio student and find out why we are Haverhill and the Merrimack Valley’s #1 choice for Music Lessons. Andover, Boxford, North Andover, Methuen, Amesbury, Groveland, Georgetown, Haverhill, Plaistow NH, Salem NH, Atkinson NH and Kingston NH. Guitar, Piano, Voice, Violin & Drum lessons in one convenient location. This saves our students time and money, as one family can take multiple instruments on the same day. At DeAngelis Studio we know how busy you can be, so we work hard to come up with the perfect schedule for you. We offer music lessons in: Electric Guitar, Acoustic Guitar, Bass Guitar, Piano / Keyboard, Voice and Drum Set. The most qualified teaching faculty in the Merrimack Valley. All of our well-qualified teachers have either university training or 15+ years professional performance experience (or both!). Our music teachers are dedicated to learning about your personal musical goals and helping you to achieve them. With at least three music teachers for every instrument, we are confident that we have the right teacher to meet your music lesson needs. In addition to their teaching credentials, our teachers have warm personalities, are extremely friendly and dedicated to teaching you the style of music that you want to learn in your music lesson. A wide range of music lesson times available for your busy schedule! Current and new customers can contact DeAngelis Studio of Music any day of the week, from 8am to 8pm–we are always ready to take your call and help you with any questions and concerns you may have. Visit our testimonial page to see what our students are saying. DeAngelis Studio has a proven track record of offering quality music lessons in Haverhill, Massachusetts year round. Our full time mission is teaching music lessons. Comfortable waiting rooms for parents. Instead of waiting in a music retail store showroom, our clients enjoy a spacious, professional waiting room with comfortable chairs, Wi-Fi, activities for kids, magazines and bottled water service. Parents get work done or relax in our waiting rooms while their child takes their lesson, Or if you prefer you can sit in on their lesson anytime you like. Fully equipped, professional music lesson rooms at your disposal. Our rooms are stocked with everything you need for music lessons, including amps, stereos, full drum kits with pads, keyboards, pianos and more. All you need to bring is your instrument. At least two times per year, our students have the option of performing in our recitals. Students are not required to perform, but many choose to. Parents never have to pay admission or any related fees for these recitals. Rock School shows and performances. 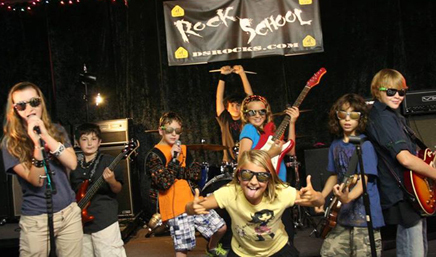 DeAngelis Studio of Music Rock School bands participate in many great events, shows and fesitvals through-out the year at major venues all over New England. At select shows our Jammers and many solo performers are also invited to perform. Conveniently located in the heart of Haverhill. Due to its central location, our music school is convenient to all areas of the Merrimack Valley. Close to our studio, you will find great shopping, dining, and other businesses, so you can wait or run some errands. We have both on-site and street parking right at our location. DeAngelis Studio of Music & Arts is right on route 97, convenient to routes 495, 125, and 110. DeAngelis Studio does not require semester minimums for lessons. Every student here is on a month-to-month basis. Don’t want to wait until the new month starts? We’ll get you started right away and prorate the month. Are ready to start? You have nothing to lose as there are no long term contracts!